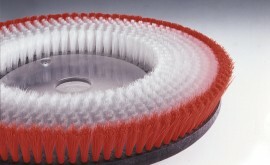 At Brushtec, we have always risen to the challenging demands of floor cleaning machine designers and answered the call for a range of brushes and pad holders for all machine requirements. The flexible drive coupling system is a product developed over the past twelve years that offers a number of advantages over standard brush and pad drive designs, including a flexible drive interface with a vibration-free operation which is especially important when used on high speed machines. The unique dynamic energy absorption drive ring uses specially formulated elastomer polymers designed for continuous flexing and durability. 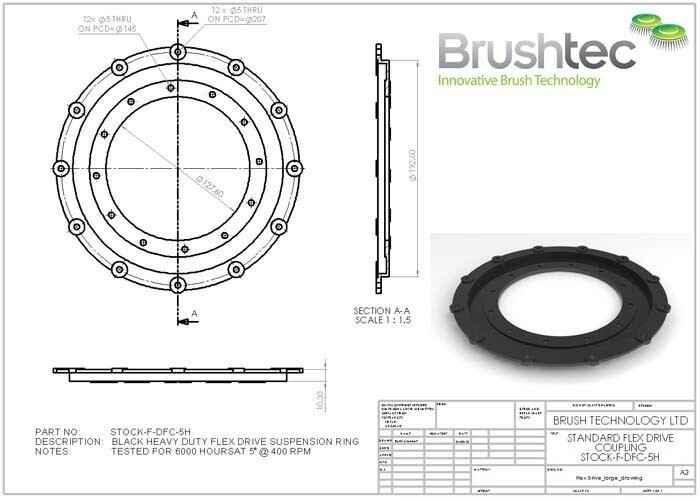 The ring flexes as the brush or pad rotates providing a smooth, vibration free operation, which is especially important when used on high-speed machines. Because machines have variable weights and speeds, we offer several levels of ring stiffness. The black ring has proven most popular and is ideal for the widest range of machines and working conditions. When used in conjunction with a pad driver, the flex system eliminates the need for foam backing, which is expensive to manufacture and is liable to wear. Our mouldings use virgin high impact resistant polypropylene which can give weight savings of up to 30% when compared to standard mouldings. This reduces energy wastage and motor stress, which is the major cause of reduced machine life. Standard disk diameters range up to 600mm and can be filled in a range of bristle qualities including synthetic, natural and abrasive filaments. Contact a member of our team today for more details about our flexible high speed coupling system, and take a look at our disk brushes and pad holders for more industrial brush equipment.